(NaturalNews) It's not just the high fat content that makes potato chips and French fries bad for you; the very process used to cook them produces potent carcinogens inside the potatoes themselves. Baking, roasting or frying any starchy food at high temperatures causes the sugars found in these foods to combine with an amino acid to produce high levels of a potent carcinogen known as acrylamide. (https://www.naturalnews.com/acrylamides.html) Because all potato chips must be cooked at high heat, and because restaurants tend to cook French fries at high temperatures to bring them to the table more quickly, a healthy diet should contain only minimal quantities of these foods. For people willing to go to a little extra effort to make French fries at home, there are ways to minimize acrylamide content. Potatoes should be stored outside the refrigerator in a cool, dark place. Before frying, they should be sliced, soaked in water for 15-30 minutes, then patted dry. They should be fried at lower temperatures for less time, until they are golden yellow -- not brown. Commercial food producers sometimes use the same frying oil for weeks at a time, saturating the oils with extremely high acrylamide levels. Importantly, even though it's found in the food, acrylamide does not have to be listed on any food labels. 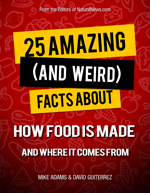 Source: 25 Amazing (and Weird) Facts about How Food is Made and Where it Comes From, authored by Mike Adams and David Guiterrez. This report reveals shocking but true things that will blow your mind about how food is actually made. Click here to download the full report (FREE) (PDF Adobe Acrobat, non-DRM), and you'll learn about weird food ingredients, food manufacturing processes and bizarre food sources. FREE report from NaturalNews.com.